Discussion in 'Unit Reviews' started by Memel0rd, Sep 2, 2018. A Tarutaru sorceress from the distant world of Vana'diel. Shantotto is a black mage who served as minister of the Orastery, Windurst's Department of Magic. Although she is a heroine possessed of formidable magical powers, she is the cause of many different incidents, as it's said her pride is higher than the pinnacles of the Gustaberg range, and her temper hotter than the magma flowing forth from the mighty Mount Yuhtunga. Don't tell anyone but the regular Shantotto at 5 star max has the same base stats as Livid Shantotto at 5 stars. It's a secret. Shantotto's basestats are weird, so do take a look at the cons later on. She has amazing MP/MAG as well as high SPR while having another whopping 50% MP with 10% MP refresh as well as 120% MAG, 30% HP/SPR and 20% DEF. To increase her MAG even more, Shantotto gains access to a 60% Magic Doublehand. That makes her able to reach high MAG easily. She also has silence, paralyze and petrify resistance. All of them are very useful as her main damage source mostly will come from spells and the other two are self-explanatory. About her trust master reward... it is as simple as effective. Once you equip her own Rod you gain access to triple casting any of your spells. Her rod gives 130 MAG, which is currently the highest MAG rod (even though Mateus Malice is only 1 off) and grants a 50% SPR break to any unit who wields it. The triple cast is definitely worth it. But if you don't have her TMR immediately, she still has innate dual cast ready. Shantotto has some minor support which might be useful if you really have trouble surviving a threshhold or generic attacks. With Mana Wall she can appl an AoE 500 HP barrier to everyone as well as 20% magic mitigation for 2 turns. It's not an amazing skill but if you can't survive it might as well use it. There are two ways to use Shantotto, as a chainer through LB crysts and as a spell finisher, though I feel like she's a way better finisher than chainer. I'll talk more about that in the cons section. When looking at her chaining abilities you'll quickly notice that they cost LB crysts instead of MP. 16 for her abilities, 32 for her LB. There are four different chaining moves, a dark/water/thunder and light move. The light chaining move has the same frames as Divine Ruination but can't be casted twice. All of these moves have a 1080% ~ 1150% modifier, innate elemental damage and a double imperil. For instance the dark chaining move imperils earth and dark by 60%. These will deal quite a lot of damage currently, but are locked behind LB crysts. Shantotto does get a bit of LB crysts support though. 1 Auto LB and a 20% chance when getting hit to counter with a 3 LB cryst fill. Her own Limit Burst is also a chaining move and is important for her finisher role, too. At max level it has an effective 7-Hit ST 2400% modifier with a 3 turn 70% fire, ice, lightning, water, wind and earth imperil AND also unlocks her powerful finisher spells for the following 3 turns. I really don't want to spell them out one by one. I'll talk about them in a minute. Firstly though, Shantotto has many spells that do not need to be unlocked. She has her own version of the Tier 1 spells that include all elements except for Dark/Light and these ones are stacking spells with a 1x mod increase each use that go up to 800% ~ 850%. All of them have a slightly different mod and MP cost, but it's not that noticeable. It'll take you two turns with Triple Cast to get these up to max stacks. More interestingly though, her Bio III may actually be useful to you. It only has a ST 120% modifier, but it breaks the enemy's ATK by 50% for 5 turns. And since it's not a stacking spell you can just cast it inbetween any of your rotations to basically get a free 50% break that lasts long. Then she has two very expensive finishers that do not need to stack up. Flood II and Flare II. Both have a 700% modifier, both have a 50% water or fire imperil. For short fights these are excellent as you won't have to worry about MP anyway and they go up to a total 2100% modifier if triple casted with innate imperils. But when it comes down to her highest damage dealing spells... there are three ways to unlock them. Your first option would be Elemental Seal. It enables access to all of them for 2 turns while buffing your MAG by 300% for the next action. This means the first spell would have another 300% MAG buff stacking on top of your generic buff from the support. The second option would be her CD move Mana Spring. Mana Spring has a 12 turn cooldown but can be used on Turn 1. Not only does it give you a 999 MP regen for the next 4 turns AND a self 150% buff, but it also grants you access to all of the spells for the following 3 turns. Due to its high MP regen buff you will not have to worry about your MP at all, just keep spamming. And lastly her LB, which I talked about earlier. So what do these spells do exactly? We are looking at one of each spell for every element except dark / light. They are all AoE and stack up with a 250% mod each with a 250% ~ 275% base. This goes up to 1000% ~ 1025% at max for each spell. This is quite powerful especially if you have some sort of external imperil or used her LB before to get the 70% one. Since you only have to use them thrice to get up to max, after one turn you will already have them at max. For stacking spells the "downside" of stacking them up isn't really coming through. But what makes these spells even MORE interesting IS the fact that they are AoE. Most of us remember our good old -Ja spells, such as Firaja. You get them up to max and then sometimes decided to use Carbuncle. That way everybody in your team had a reflect buff. Afterwards you'd use your -Ja spell on your team once and on the enemy to get a total 4200% / 3600% finisher. Well.... what if I told you that you can do the same with Shantotto's e.g. Thundaga V? That's right. Shantotto's OTKO potential that way is absurd when running a 6 or 5 man party. Thundaga V for example has a 1025% modifier. That'd mean only with one usage on a 6 man party with Reflect you'd have an effective 6150% modifier with innate element. That one is quite beastly. With triple cast you'd now have a 8200% mod. This is looking really nice! I think we can make this even more interesting. If you got them up to max, use Elemental Seal. As I explained earlier, your first spell with have an additional 300% MAG buff. This means the first spell that gets reflected with its ~6000% - 6150% modifier will have a huge MAG buff on top of it for ridiculous damage. THIS is what I call burst damage. It is very gimmicky but INSANELY rewarding. Livid Shantotto has a few cons here and there. The first thing everybody will notice about Shantotto: her HP is horrible. 7*s have huge stat boosts and she doesn't even get up to a total base HP of 3700 whereas most other units sit at 5000+. Shantotto did get a 30% HP buff in GL that helps her survive, but essentially her low HP and mediocre base DEF put her at risk of dying while stacking up her spells. This also makes her LB cryst counter a bit more controversial as I wouldn't want such a frail unit to get hit too often. Obviously Shantotto's MP cost will also be high. Her Mana Spring counteracts any kind of MP consumption, but if you don't have it up even with her huge MP you might run out at some point. Most noticeably will be her Flood II and Flare II as they cost 110 MP each cast, which is why I said that they are designed for short fights. Her -Ga V spells cost 62~72 MP each cast. Livid Shantotto can be used as a chainer and currently it'll be very strong IF you can pull it off. However, getting 16 LB each turn to keep your chains up for two copies of her seems unlikely unless you have a heavy LB team. These chains are ST instead of AoE so even against multi boss type enemies you can't collect "more" crysts than you would usually. Waiting for her first chain move might also take some time since all her multi hit abilities cost LB crysts. How are you going to collect them without chaining? Relying on her counters to proc doesn't seem like the best idea due to her frail nature as well as only having 1 auto LB innately. One of her abilities, Colossal Shantotto, also seems ... useless. It deals AoE 320% dark damage with only one hit and then buffs her own mitigation by 30% AND increases her DEF/SPR by 120%. I mean I get the idea that you can't use Guard if you want to use her stacking spells, but most supports mostly cover these stats. It only lasts 1 turn as well. Meh. This leads me to another issue of her stacking spells. TO BE FAIR they really don't need a lot of time to stack up so it isn't nearly as much of an issue as with someone like Emperor. If you use stacking spells you cannot use Guard, you cannot use a generic attack nor are you allowed to die. Dying for Shantotto won't be as punished since her -Ga V spells are at max after only one turn, but it'd still hurt her average damage output. Livid Shantotto has no enhancements in JP yet. I pretty much explained all there is to her Reflect Finishers that might be interesting to you. In the future we will see many many better magic chainers. Pretty much any magic chainer will be better than Shantotto in that regard. Mediena, Trance Terra, maybe Elly and way down the road Dark Mage Golbez. Depending on their GL upgrades Barbariccia might also be a powerhouse, even Lulu will be a better option for chaining. AND MAYBE MAYBE White Knight Noel? We shall see. Shantotto as a finisher though due to the reflect niche might be useful to you for a very long time. Most incoming magic finishers can reach quite ridiculous numbers, though they aren't too many coming. Emperor will be able to get a 5000% modifier every turn once he's fully stacked up while Mediena gets Triple Cast as well as a 100% ice imperil. Elly, if she comes, as well as Freya are going to be powerful magic finishers, too. And lastly Blossom Sage Sakura. But none of these units can reflect cast their spells. So Shantotto will always have a niche use. Very simple, no limited TMRs, one TMR and one STMR build. How is the unit as a 6*? Livid Shantotto as a 6* can still be quite effective. She still has access to her -Ga V spells through Elemental Seal as well as her Limit Burst making her potentially another Reflect Finisher once again. This time though she only has access to Dual Cast as well as HORRIBLE HP stats. Her 30% HP boost is locked behind her 7 star version and her base stats are about 1000 HP less regarding her basestats. So you'll have to seriously watch out or she'll die immediately. I'd say for 10 man trials a single copy of her is still worth a shot simply for that massive burst damage coming from a reflected -Ga V spell with the 300% MAG buff. Her 7 star only adds Triple Cast as well as easier access to the -Ga V spells. When it comes down to her Arena potential it isn't nearly as good as you'd expect from a triple casting mage. All her spells that aren't locked are Single Target, making them pretty much unviable. And these are her only innate AoE spells. Shantotto's HP isn't fitting the Arena theme very well either with a base HP of ~3700. But you can make her work if you give her Ring of the Lucii and triple cast Alterna. She'd also get some evasion that might make her survive the incoming attacks. As usual, let's take a look at her chaining and finishing capabilities. Though I'll do actual comparisons this time around since Shantotto as a chainer isn't... a regular chainer per se. Basically we take her thunder chaining move and add the 60% imperil. Using her LB might be better for burst damage, however it takes double the cost of it and can't utilise elemental weaknesses from the enemies. Besides, you want to chain as consistently as possible on both Shantottos. That reflect damage, oof. I left out her LB imperil because collecting 32 crysts might be tricky while this rotation will have infinite MP due to Mana Spring as well as being accessable at ALL times as. Her reflect damage is also really high. You can't finish reflect properly sadly. As a chainer I'm not a fan of Shantotto due to her inconsistency and unable to generate LB crysts outside of her actual chains. In comparison, Rinoa has relatively easy access to Triple Cast as well as having consistent Tornado chains that you'll never be unable to cast unless you lack the MP while also having a lot of chaining partners. But as a finisher Livid Shantotto is on a different level. Even for short fights as long as you have a 50% imperil, which her Flood II and Flare II do have, she will be better than a triple casted Apocalypse WHILE not needing a turn after Turn 1 to regain her triple cast. Rinoa wins as chainer. Therefor Seabreeze Dark Fina. Livid Shantotto wins as a finisher. Especially as reflect finisher currently the strongest solo damage source. Her TMR is alright and interesting for events. It is a rod with 130 MAG, which is one higher than Mateus Malice whereas that rod has 10% HP, so you'd usually not use it unless you obviously do not own an Emperor or you are using it on Shantotto herself. But it grants a neat ability that deals dark damage as well as applying a 50% SPR break, which can be great for any kmog, story event or what so ever when you are not feeling to bring a unit that actually has breaks. I'd only farm it if you are going to use Shantotto though. Her STMR though is a whole lot better than her TMR. It adds an incredible amount of 80% MAG when you equip XY unit with a rod as well as adding a 5% MP refresh. This is a nobrainer STMR on every mage out there for now and in the future. The 5% MP refresh also helps out very MP heavy units decently. Trance Terra, Elly, Shantotto herself and Rinoa can all use some more MP refresh. It's a great STMR and I wouldn't use 2 Shantottos over getting that bad boy. Just like Shadow Lord, I am surprised at how good Livid Shantotto can be. At least as a finisher. Livid Shantotto has the option to chain and I'd leave it at that. Making her a chainer requires you to either run entrust auto LB units or auto LB on herself and even then it'd be quite delayed. Before getting her chaining moves she is unable to generate crysts consistently and she can't genere more crysts on off turns. Both Shantottos need the LB crysts. If one of them is one short that means another turn of no chaining for you. It CAN work, but it seems a lot more gimmicky than using self reflects. As a finisher she has way more potential. Generally her triple casted -Ga V spells are quite strong but will be outclassed by other finishers fairly soon, such as Emperor and even Dragonlord's 7*. But as a reflect damage dealer her damage output is bonkers. I've only used a 50% external imperil in my calculations, now imagine her using them after let's say a Reagan Limit Burst with his 100% imperil. This is some serious damage and if you saw how much Olive can deal, you'd be very surprised to see a Shantotto dealing 3x or even 4x as much damage. Her drawback is her poor survivability and she does need as much protection as possible. Otherwise she'll likely just pop and die. Livid Shantotto is still not worth pulling for because she is on a double 5 star banner with no step ups as well as Shadow Lord not being as powerful as her. I'd be interested to see people use her with reflect though. I can only imagine. Also, can we stop with units being both chainers and finishers? Hm, Shadow Lord's sprite is sick and I'm a sucker for gimmicky finishers. My temptation is there, my reasonable brain just disagrees. Aaaa111, aa25, Takumi Kuzuryu and 28 others like this. I hate her ST magic/abilities. This banner is sneaky tempting.. I see my weakness is blatantly obvious. Split it into SSP:Light and 30% mag /20%hp materia to get cap while getting 40% hp more... definetely better than living single slot for 30% hp max. I must have missed something on the STMR build; couldn't she get up to 1878 MAG with Unmatched Wizardry in that "free slot"? I'd go for her if I didn't already have a 7* emperor waiting. Shanotto multi elemental availability makes her much better tho. "Ideally" you'd probably go for the killer materia such as Barbariccia's Spirit that ALSO adds 30% HP . I'm pretty sure I used FFXI, but I can't seem to edit Tags out. I'd love to get her but her and shadowlord are proving to me the problem with base 7 star units,, in that they really need to hit 7 star to be worth anything. Also, I haven't used her in a serious trial yet, meaning that nothing ever survived long enough for me to have enough crysts for her chaining moves. On the plus side, never ran out of MP either. As it turns out, 10% MP regen's pretty good if you're having 800+ base MP. But yeah, her HP. even with the GL buff... Let's just say barriers will be valuable. Most of it is pretty much taken from Final Fantasy XI. Most spells would be gotten in tiers (like Stone I, Stone II, Stone III …) and you would always have Stone->Water->Wind->Fire->Ice->Lightning. For every Tier Stone would be the weakest and cheapest while Thunder would be the strongest and most expensive (MP wise). Stone, Water … would always be single target while anything with -(a)ga like Blizzaga would be AOE. Elemental Seal was the active Ability of Black Mages with (originally) 10minutes cool down. It would greatly boost the accuracy of the next elemental spell. Flood II and Flare II were ancient Magic you could get with merit points at max level, kinda sad she is missing the remaining 4 elements. Bio was a Dark Magic spell that caused a dark damage dot and reduced the targets attack, BIO III specifically was a merit ability that only Red Mage got, meaning Shantotto (a black mage) couldn't use it. Manawell was another Black Mage ability that was introduced with one of the last expansions. It would reduce the MP cost of the next spell to 0. Mana Wall was an ability that made any damage you take reduce your MP instead of HP. Fast Cast was the Red Mage only passive that would reduce the cast time of spells and finally Chainspell was the 2hr (basically ultimate) of the Red Mage, reducing the cast and recast time of all spells to 0 for (I believe) 1 minute. 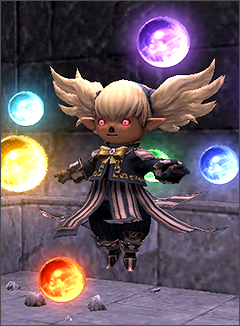 Not really sure why the black mage Shantotto got so much red mage spells/abilities in Exvius though... nor why she has dark and light damage. Great review! She’s an interesting unit as a finisher for sure!! PM me what you want. Her HP growth is actually worse than Tilith which explains a lot. I can get that she having less HP than usual but 3000 base HP when other mages like Dark Fina get like 4500 k base HP is kinda hurtful. Not only that, there are 6* max mages which have a better base HP than her and that category includes even Exdeath. Also, she may not Triplecast AoE black magic in the arena but that is why equipments and espers exist. If you can teach her spells with something like Arc Arcana or an esper she can use AoE triplecast easily though. In Arena 900'ish MAG is enough to guarantee reaching the damage cap with many of the usual black magic so even if you give away a good deal of MAG with taking Arc Arcana, you can reach the damage cap easily.